Do you remember watching any spectacular acrobatics show? Imagine watching not only that but a lot more. 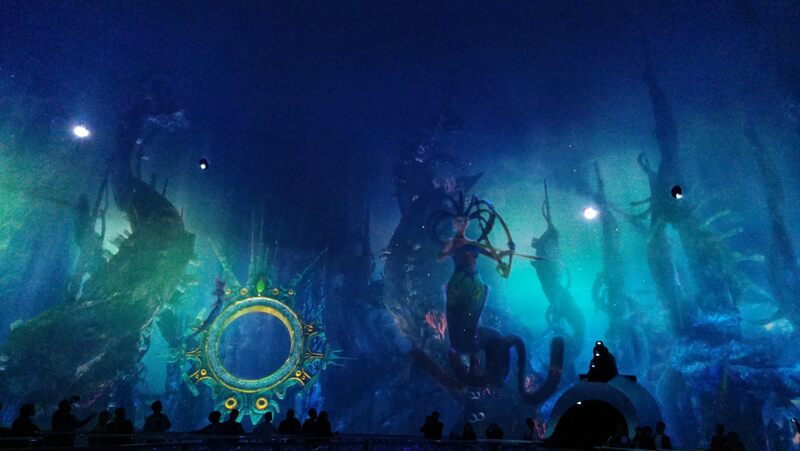 This is exactly what you get at the House of Dancing Water show at the City of Dreams in Macau. The show presents a dance drama which not only travels in time but is also supported by stunning engineering work. In fact, I think without the engineering work, the dance drama would lose its effect by half. Seated in a 360 degree theater, the drama opens on a stage of water with actors swimming and coming out! Yes, it is water! Shipping platforms rise, incredible audio and light equipments create thunderstorms and lightning and the actors perform on these platforms. They tell a story and they also jump into the water on stage from the platforms that rise many meters in height. Water cannons shower water in all shapes which are used incredibly in the story. Small boats come sailing on the stage which itself alternates between a dry platform, no platform (only water), partially dry and partially filled with water. The water cannons shoot from holes in these platforms and the water sprinklers on the part of the roof covering the stage create rain. There is an incredibly complex mechanical control near the roof top spanning the stage area to slide actors onto the stage, pull them away, make them fly etc. Aside from the brilliant performance, you can only wonder at the amount of engineering ingenuity that has gone into making all this possible. For one-tenth of the cost of a ticket to House of Dancing Water, one can also watch another show called “Dragon’s Treasure“. You can imagine yourself standing on a stage that cuts right through the center of a sphere. The top half of the sphere is the screen on which a story related to dragons is played with brilliant sound and light co-ordination. You need to turn your head all around to follow the movements of dragons on the gigantic screen. This immersive experience is enhanced further by the dragons spitting fire through the holes that you see on the screen in the image above. Of course these dragons are not real but the fire is! These shows confirm that it is possible for art to achieve greater heights using engineering to its advantage. While engineering plays a secondary role compared to the story and the imagination of writer, it does enhance the overall effect! The audience walks away with a sense of having spent beautiful time and money worth spent.